Reykjavik has a distinct vibe going on. 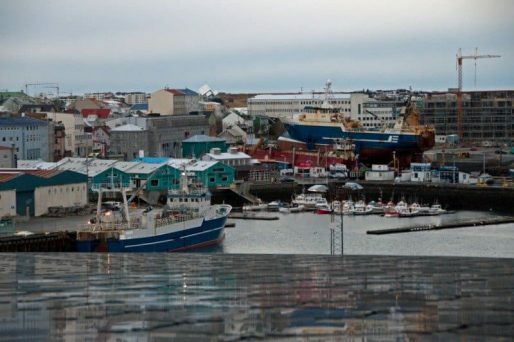 It has a small-town feel; traditionally built wooden houses, shops packed with local design, café culture, restaurants serving amazing food, all built around a working harbour. But there’s a definite edge. 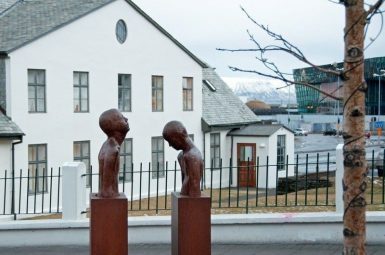 Reykjavik is an intriguing capital full of creatives, culture, off-the-wall architecture, art and, of course, nature’s stunning backdrop over Faxaflói Bay to Mount Esja. So, what to see and do in Iceland’s capital city? 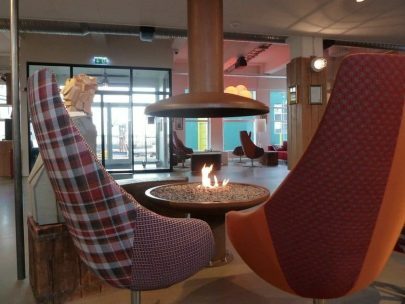 Here are my tips for visiting Reykjavík, Iceland’s oh so cool capital. 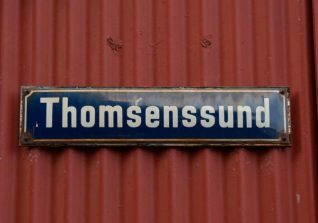 The first of my Reykjavik tips is to head downtown. 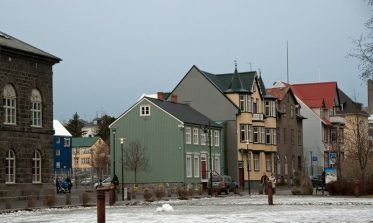 Reykjavík is compact so it’s easy to walk round and you won’t get cold feet because there’s under-road heating to keep the roads clear of snow, although a brisk wind whips across the bay giving the city an air of freshness and energy and the weather seems to change every fifteen minutes. 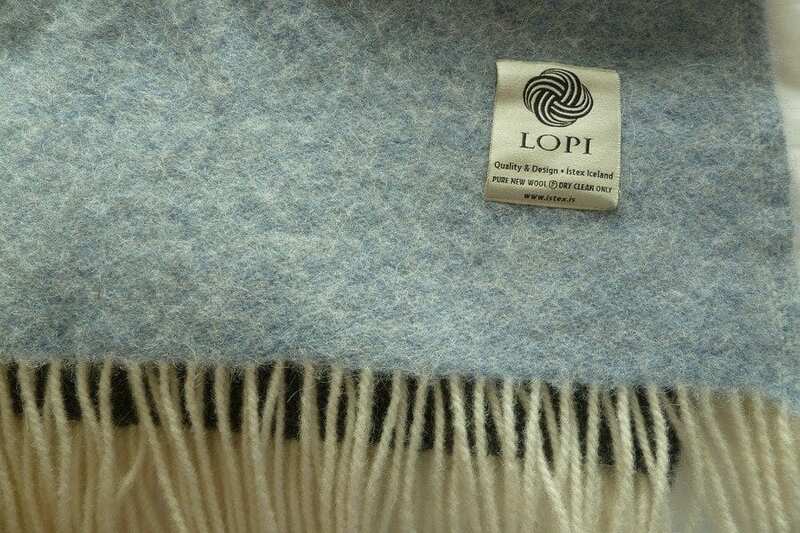 Wear lots of warm layers and pack a waterproof – hats and gloves are essential in winter. 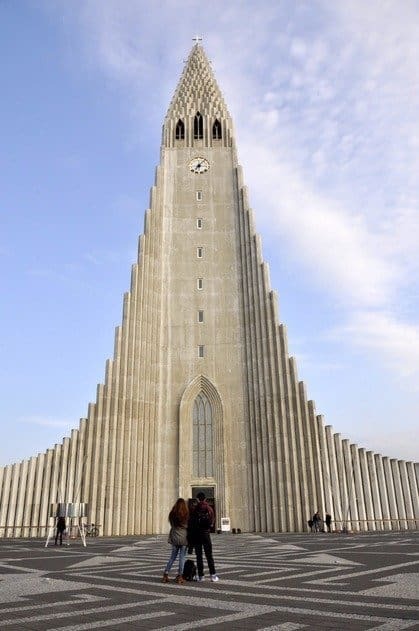 Hallgrimskirkja Church is seen from pretty much everywhere in Reykjavík as it’s the city’s most imposing building with its basalt spire rising 244 feet. Needless to say, there are fabulous views over the city rooftops, to Faxaflói Bay and Mount Esja and you can take a lift to the observation deck for around 700 ISK (approx €4.50). 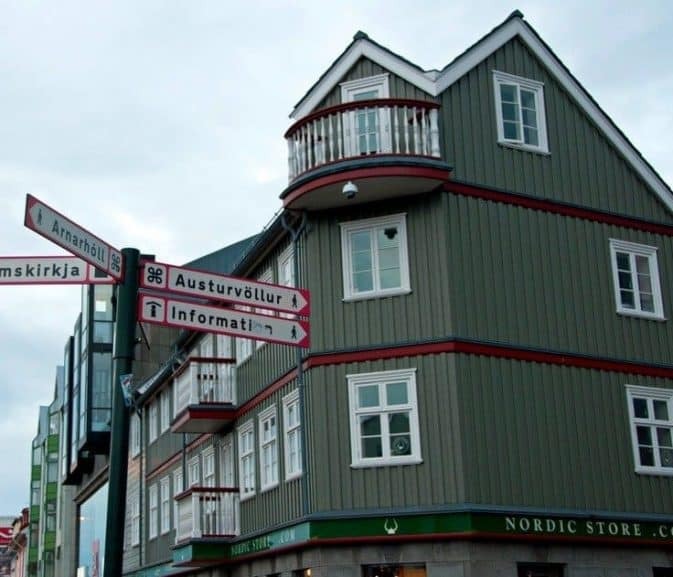 Go here early on in your trip because as well as enjoying great views it gives you a chance to get your bearings of downtown Reykjavík which, incidentally, is the northernmost capital city in the world. 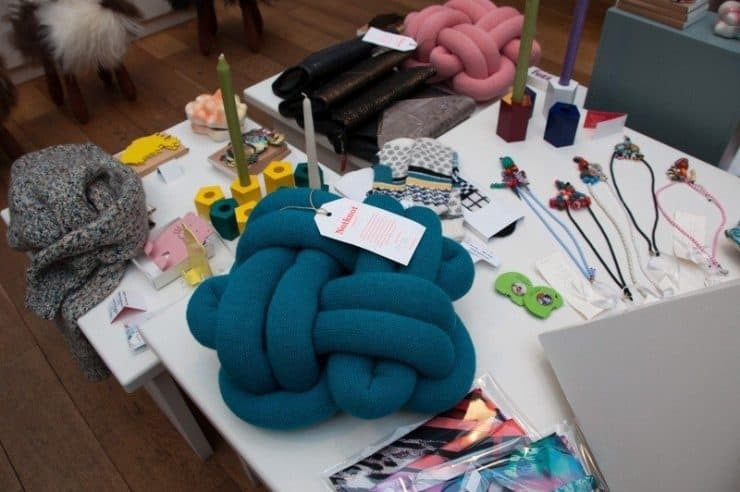 If you ever wondered what Icelandic people do during those months of dark days and long winter nights then just drop by any craft shop. 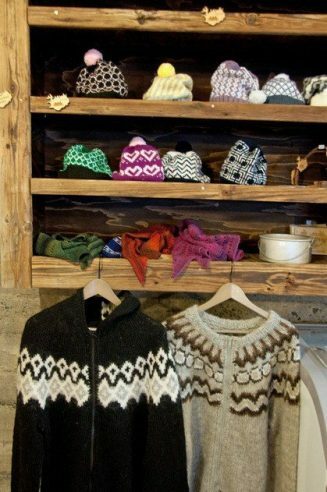 The famous lopapeysa (Icelandic jumper) is displayed in many of the shops along with hand-knitted hats and gloves with lovely Icelandic designs worked into them. 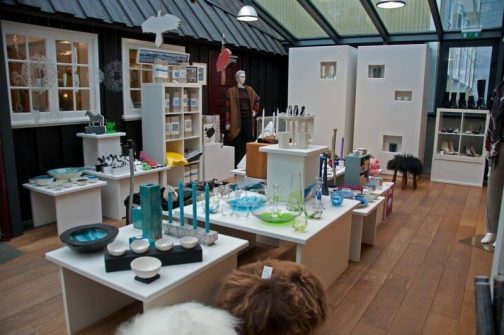 I spent ages browsing in the crafts shops which are all around Reykjavik. 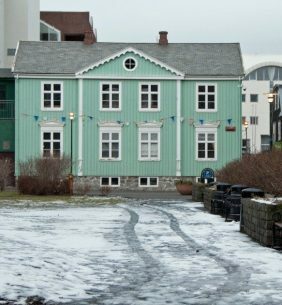 Kraum was my favourite representing over 200 Icelandic artists and said to be the oldest wooden building remaining in the city. 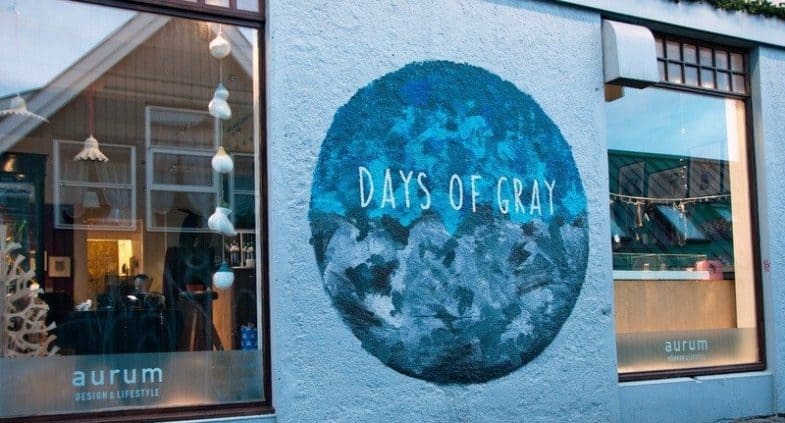 Reykjavik tip: you can get good discounts with the Voyager Card. 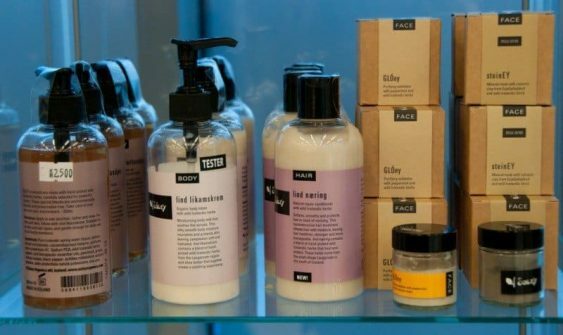 I loved the plaited cushions and the gorgeous smelling Soley organic bath and beauty products infused with Icelandic herbs. Reykjavik means Smoky or Steamy Bay and the name probably relates to the steam coming from hot springs in the area. 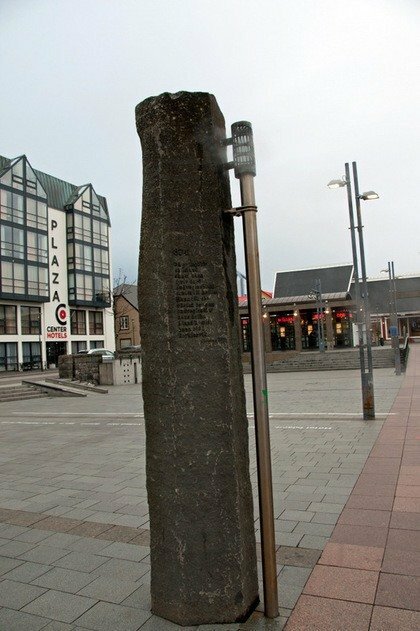 Around 870 AD, Norwegian Ingólfur Arnarson, in Viking tradition, cast his high seat pillars into the sea when he landed in Iceland and built his settlement where they came to shore. 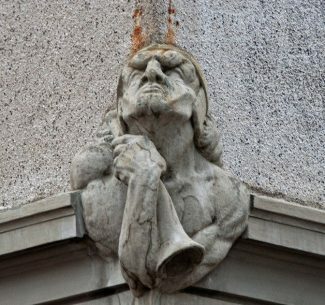 Two columns in Faxaflói Square trickle hot water which wafts steam into the air symbolising the founding of the city. Geothermal water is used to heat around 90% of Iceland’s homes; the hot water from the springs is cooled and pumped from boreholes straight into the taps of nearby homes. 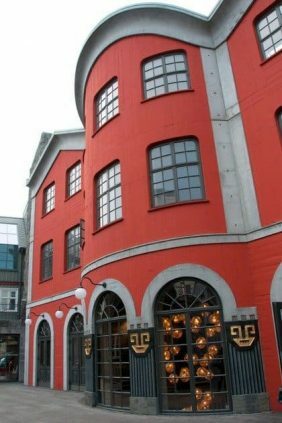 This fabulous Reykjavik design hotel is located next to the dry-dock and slipway in Reykjavik Harbour. It’s bright, colourful and vibrant, in fact I heard it used to be an old paint factory. 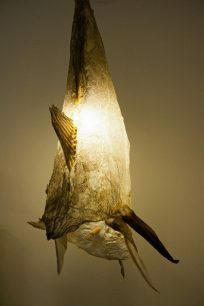 There are cool, quirky elements and nautical oddities reclaimed from the harbour area. It also has a fun bar area, restaurant and serves up a great breakfast. 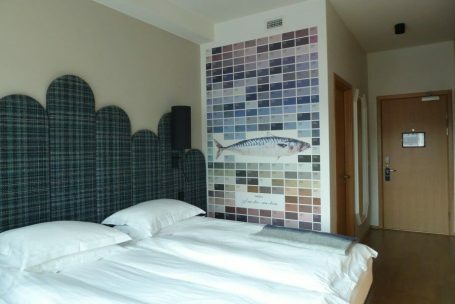 I’ve stayed in Icelandair Reykjavik Marina Hotel twice and would definitely stay again. 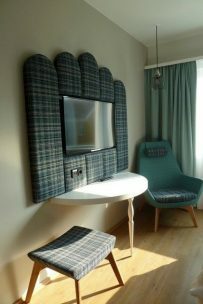 The rooms are light, airy and many of the design elements are locally sourced. 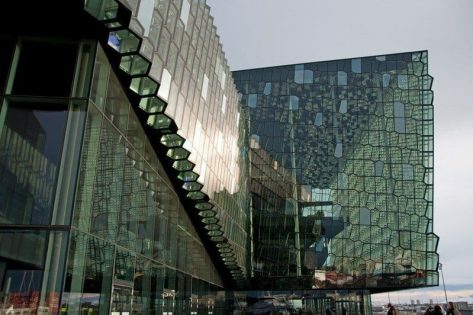 As it’s only a ten-minute walk from the town centre and a few minutes from Harpa it’s perfectly located for exploring the city. 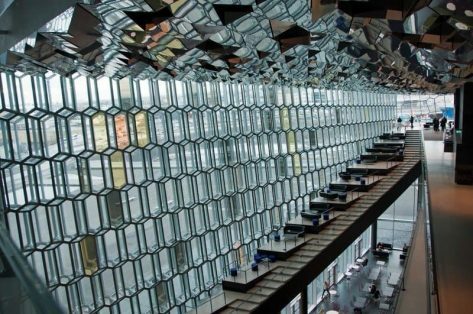 Visit Reykjavik harbour and Harpa, the city’s striking concert hall, home to the Icelandic Symphony Orchestra. If you’ve got your camera you won’t put it down because the building has so many fabulous lines and shapes that you’ll find a photo opportunity around every corner. 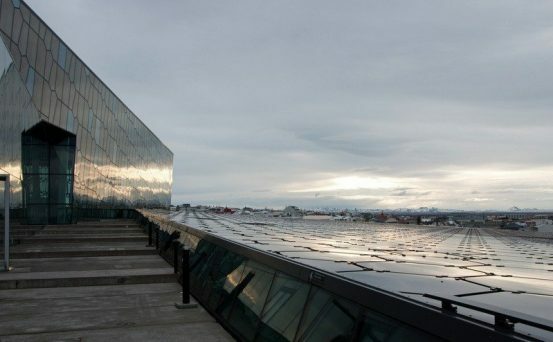 The honeycombed glass catches the wonderful clear northern light – it’s a stunning building with equally stunning views across Reykjavik’s harbour (hafn) and Mount Esja to the north. If you head up to the higher levels there’s an outdoor terrace overlooking the city – chilly but worth it. 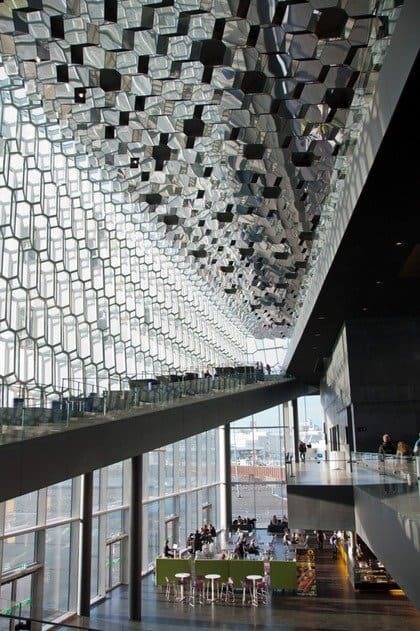 The café, Scandinavian Pain Bar and restaurant serve excellent food and there’s a music, book and design store – even if you don’t have time for a concert there’s so much to see at Harpa that you could easily spend a few hours here. 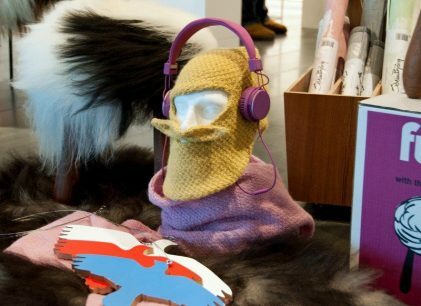 These are just a few of Reykjavik’s cool and quirky gems. 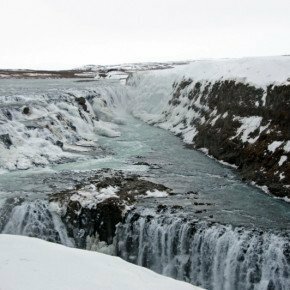 Once you’ve checked them out head further afield to the geysers and waterfalls and the natural wonder of Iceland’s Golden Triangle, go in search of those dancing Northern Lights or take a dip in the steaming Blue Lagoon. There’s a private airport transfer that’ll drop you off at the Blue Lagoon for two hours and then take you to the airport. 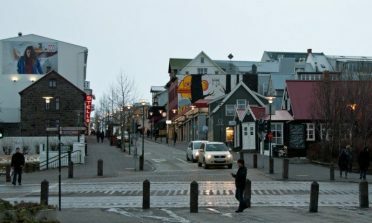 There is no public bus from Keflavík Airport to Reykjavík but there are two bus services you can take. Either the Flybus or the Airport Express. They offer similar service at a similar price – the difference is that the Flybus offers a service connected with every flight while the Airport Express state on their website that transfers must be booked in advance for a guaranteed departure. 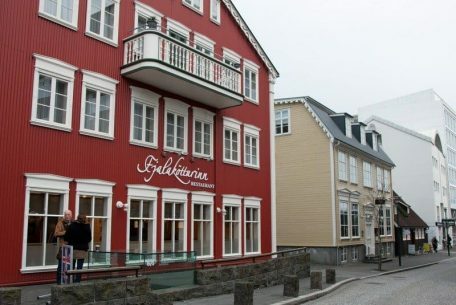 However, Airport Express offers a complimentary pick up and drop off service for all the major hotels and guesthouses in Reykjavík while the Flybus charges 500 ISK extra per person for that service so work out what’s best for you. The Flybus offers free WiFi on all their buses. Taxis running between Reykjavík and Keflavík charge by the meter although they sometimes offer a fixed price which comes to about the same amount as the meter. There is a taxi queue outside the arrivals hall but you could also book one in advance. The average price for 1-4 people is around 16.000 ISK. 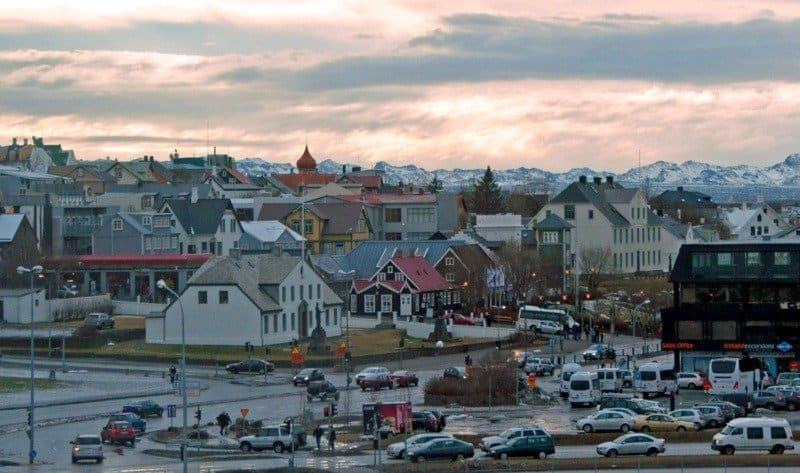 The journey to Reykjavik takes around 50 minutes. Do you have any Reyjkavik travel tips? Please share in the comments below. 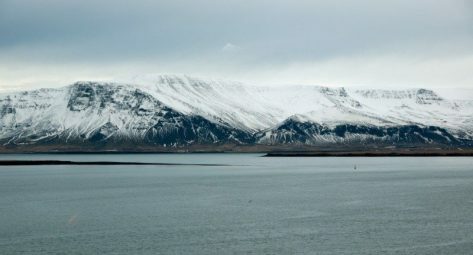 I love Iceland and Reykjavik was such a fascinating city, hope to head back one day soon! I’m dying to visit Iceland! I’ve been doing research about it for the past month and I’m hoping to study abroad there next Fall. 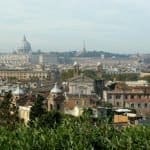 This list is really helpful and makes me want to go even more! I hope you get to go long-term when you study – it’s such a beautiful country. Reykjavik is one of the nicest cities we’ve been to so far. It’s really fun to just stroll through its streets, soaking up the atmosphere. There are lots of nice cafés and restaurants and lots of places with live music. What I also loved was that I was invited for coffee in three (tourist-)shops without buying anything. 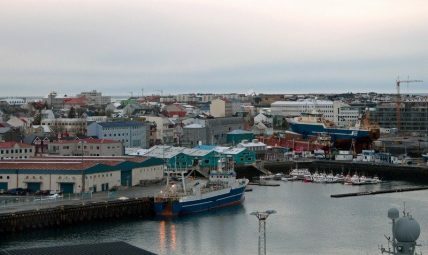 What I highly recommend is joining a whale-watching trip from the old harbour, right next to the city center. And, as you said, Reykjavik is just the entrance to what must be one of the most fascinating countries in the world. It all looks SO pretty, I cannot wait to visit Iceland one day. That day can’t come soon enough though. Congratulations on the move to self hosting. Was it hassle free? Have been considring it for some time, but still undecided. I love that first shot of the town, just a great image to start the post with. Also, just so you know, the share thing scrolls with you and actually gets in the way of the photos and text as you are reading and also obscures these text boxes in the comment section. Hi Amy – thanks for dropping by and also for letting me know about the scroll bar, I’ll take a look and see what I can do. What a wonderful place to visit Suzanne! 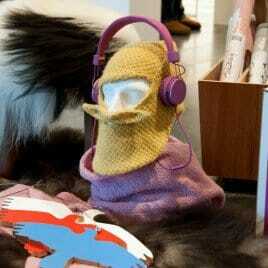 I’m sure that I’d want to do some serious shopping there too, especially the knitted goods. Great information! I loved the stores Meg – just didn’t have a big enough suitcase! 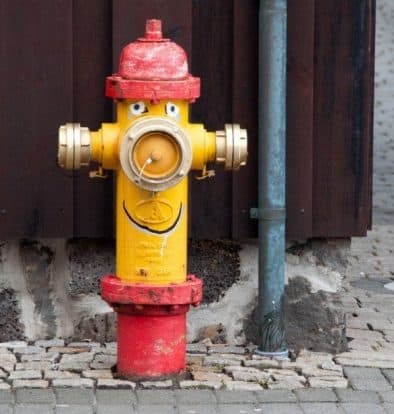 Suzanne, this is one cool post … and I just love your new look!!!! Only in the daytime – stayed in the hotel in the evening Marina Hotel in the harbour has a great bar. They don’t start bar crawling til about midnight in Reykjavik! Wow, under the road heating that is such an excellent idea for cold countries – it’s the first time I have heard of it. They certainly know how to utilise their hot springs! Yes, I’ve changed over (not sure whether it was a good move or not yet). Hopefully you won’t have to log in again if you re-visit – thanks for putting up with the admin! This is a really informative post! Coming from one of the hottest countries in the world, (as much as we love beaches), we still dream of exploring cold countries. 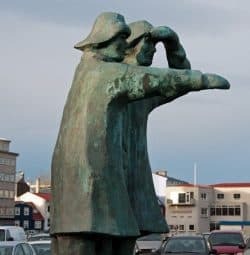 Reykjavik has always been a bit of a mystery to me, and I really enjoyed learning more about this destination, which sounds very interesting! Thank you – I find cold climates so much more exciting – lovely as it is I can’t spend too much time on a beach! 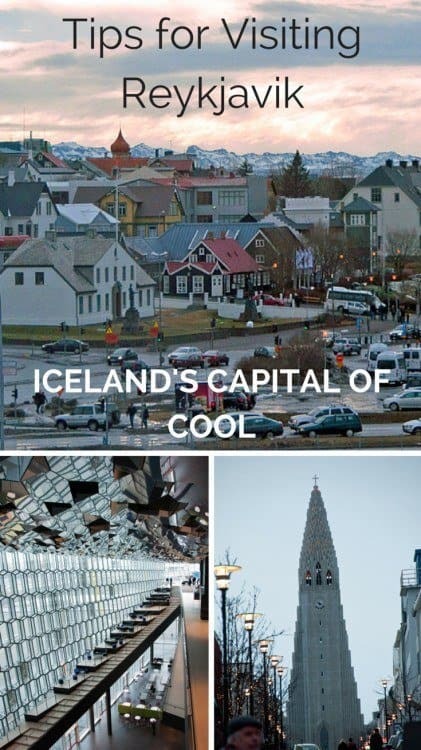 I hope you visit Iceland yourselves soon. Looks wonderful! The concert hall looks a spectacular building. 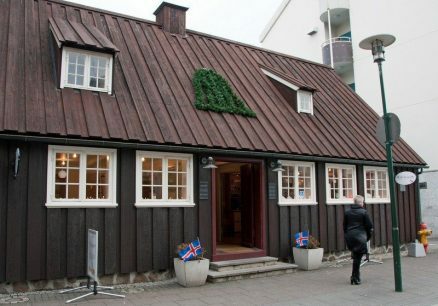 Would love to visit Reykjavik, sounds like a great city to explore on foot. 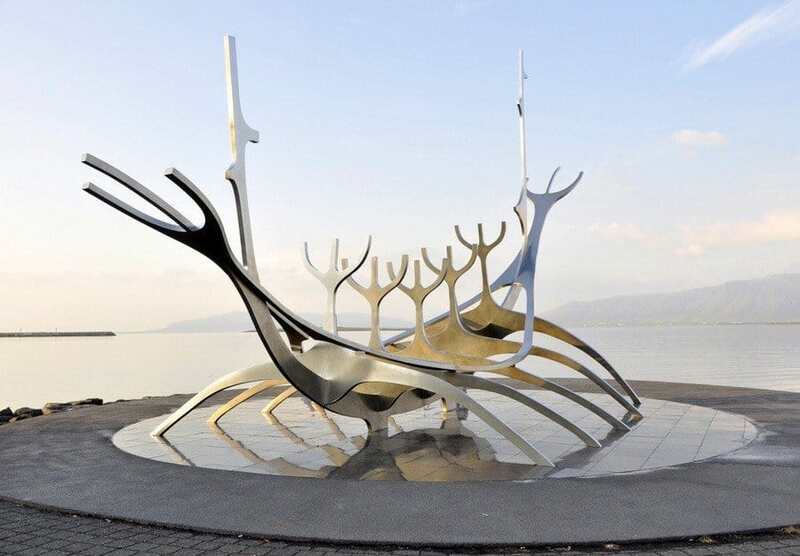 Hope you visit soon Lucy – you can cover Reykjavik in a day which then leaves time for exploring further afield.